Having read an obituary for Ron Williamson, Mr. Grisham was inspired to look deeper into the man’s life and the false conviction that imprisoned him on death row for eleven years. Ultimately cleared of any wrong doing – coming within 5 days of being executed – Ron’s tale, and that of three other people in Oklahoma fighting wrongful convictions, is about so much more than just a man wrongfully accused. Ron seems to be the only innocent person in the whole story, as bad police work (including an abundant reliance on jailhouse snitches in multiple cases), ineffective lawyers, poor judgement, and stubborn refusal to admit error coalesce to nearly drive a man insane. So much was so horribly wrong in this case that even Ron’s exoneration, thanks to the hard and diligent work done by The Innocence Project, doesn’t really satisfy. The Innocent Man contains so much history about the area, the people, the atmosphere, and the mentality of Ada, Oklahoma in the 80’s and 90’s that you’ll feel like you’re right there with Ron, through every dashed hope and every tragic step. Of course, a reader must acknowledge that there are two sides to every story, but with such a comprehensive collection of evidence and the advantage of distance and time, it’s difficult to fathom that Ron’s situation happened at all. And even more difficult to fathom that it is still happening today. This book was originally published in 2006. I’ll admit it – I didn’t even know this book existed until the Netflix special appeared on my to-watch list. I wasn’t sure what to expect, knowing John Grisham only through his legal thriller fiction. But the story intrigued me, and I’ll say this: I was not disappointed. To skip this novel and only watch the Netflix special would be a disservice. The Netflix special (which I did watch) has a different, if just as important, agenda. But the book is John Grisham at his John Grisham-iest. 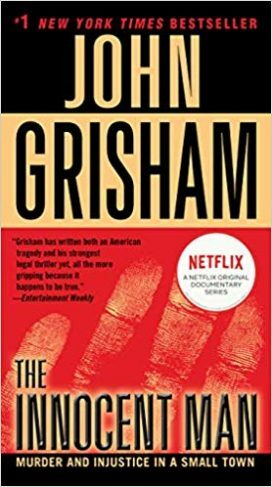 Ridiculously well researched, expertly told, and filled with all the intrigue of his best works of fiction, Mr. Grisham pulls out all the stops and uses every resource he has to relate a life so tragically underserved. And the result is a story that refuses to let you put it down, and refuses to let you forget that it all actually happened. For more information on The Innocence Project, please visit www.innocenceproject.org. Disclaimer: I am in no way affiliated in any capacity with The Innocence Project.